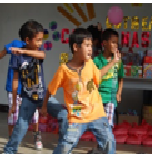 Silay Institute community celebrated the Christmas season by throwing a fun-filled party to the young and old of their adopted barangay, the Gawad Kalinga Village of Dacutan Diotay, Brgy. Guinhalaran, Silay City las December 21, 2013 at Silay Institute, Quadrangle. 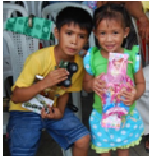 It was a very memorable day for all the kids, moms and dads, and most especially for the old ones because they received gifts and grocery items from the major stakeholders of the school. Each faculty, staff and some parents sponsored all the gifts given to the children which they truly enjoyed and proudly flaunted to their parents. Other parts of the program which were actively participated and enjoyed by everyone were the dance numbers from the kids of Gawad Kalinga, animated song and dance presentation from the Children’s Literature class of BEEd III students where they wore different animal-inspired hats like bunnies, tigers, panda, penguins and cows, and the parent-child tandem games. The joy and the love shared by the whole S.I. community and Gawad Kalinga families will truly be remembered and treasured. 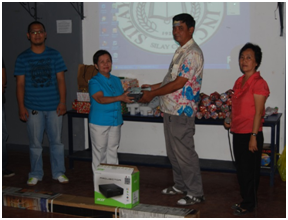 As the spirit of love and sharing came, the college Parents Teachers Association headed by their President Mr. George Gonzaga, donated one (1) unit of LCD Projector with wide screen for the computer laboratory 1 of the college. It was received by Dr. Rosario J. de Guzman, the School Director and Concurrent College Dean and I.T. Program Head Mr. Frederick Villaluna during their Christmas Party at the Audio Visual Room of Silay Institute last December 14, 2013. After the turn-over of their projects, the parents and teachers continued to enjoy the party, games, and sumptousfood which were prepared and facilitated by the faculty and the BEEd students. The exchange of gifts and the giving of prizes for the winners of the games added to the excitement of everyone. As the school celebrates the annual “Paskuhan sa S.I.” last December 01, 2013 which was held at the front lawn of the school, several presentations and competitions were held to open the season of love and joy. A presentation on “The Nativity” was held to commemorate the birth of our Lord Jesus Christ. Amon g the competitions held were the best in lantern making which were participated in by the Silay Institute Arts Guild (SInAG), the best in indigenous Christmas Tree which were participated in by all the students in the college and high school departments, and the best in parole light. Dance presentations featuring different light effects added to the excitement of the audience. Everyone in the audience said, WOW! When all the Christmas trees, lanterns, and the rest of the lights in the campus were lit altogether by Mr. Arnel G. Esguerra, the ADEC-Silay Director. Students and guests were giggling with fun and excitement while taking pictures on the beautiful spots around them. It’s a merry and happy season indeed for everyone.